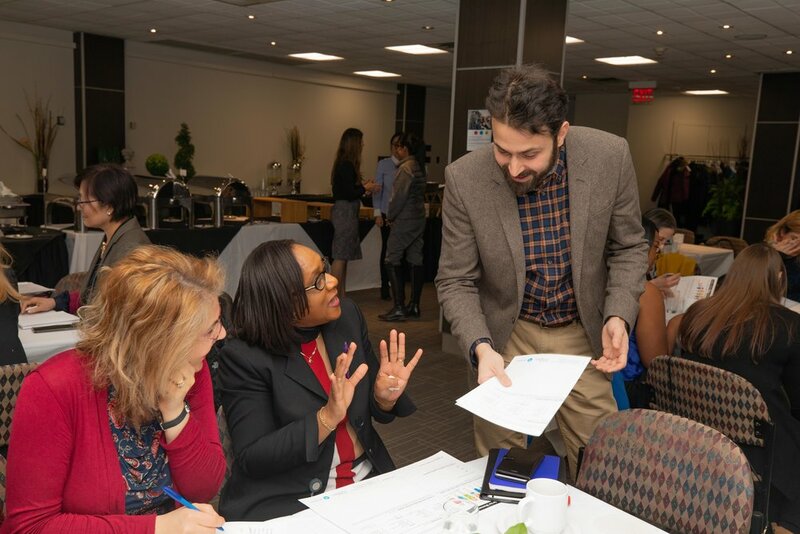 Milad Alizadeh-Meghrazi from Myant shares with delegates worksheets they will use to brainstorm ideas for women at a specific life stages. During a recent International Women’s Day Leadership Symposium, Alexia Economou from Daily Goods Design LABS (DGDL) sat down for a short interview with Debbie Wu, Material Engineer and Product Manager, at Myant Inc. Myant has ‘the world’s first end-to-end IoT* platform - SKIIN Textile Computing™ - that knits innovative sensors and actuators into smart clothing and fabrics’. Debbie and her MyantBio team are looking at ways technology can be embedded in textiles to improve people’s health. DGDL: What does Myant Bio do? DW: Myant Bio is trying to access as many bio-markers as possible, in an non-invasive way, to eventually co-relate biomarkers with diseases. The focus is on preventative and predictive health. We are looking at ways to move health monitoring from medical sites such as hospitals to the home. DGDL: Today you hosted an exercise for delegates to design future products based on existing issues for women, can you tell us more about that? DW: The project today was aimed towards women for International Women’s Day. We wanted to look at products that could be developed for females, and elderly, by simply focusing on life stages. DGDL: What attracted you to Myant as a company? DW: I came to Myant for two reasons: I was impressed by how the company was trying to combine technology with nature - because people have to be comfortable with the technology in order to adopt it. Its textiles are as discreet as possible so as not to force people to change their habits in order to use this technology. And [secondly] Myant has a very diverse team, from biochemists to fashion people, all under one roof. It is very fast and easy to prototype ideas and therefore, it is a very exciting place to work. DGDL: One of our missions at Daily Goods Design LABS is to inspire more women to enter STEAM careers. What advice would you give them? DW: Don’t be held back by industry stereotypes. Act - don’t be isolated. I have always been encouraged by men in the industry and have never felt discriminated against, but you have to be confident and dream big. Girls often bury their own voice, but it is important to create your own opportunities and not wait for them to appear. DGDL: Can you give us an example from your own life? DW: I approached my manager to move from R&D [Research and Development] to Project Management. I highlighted my skills and relevant past experiences. Then, we discussed ways that I could take on more responsibility in up-coming projects. I built trust gradually on small projects and responsibilities, and then my manager approached his manager about progressing me. But you need to provide evidence and sell yourself. Women can be much better than men at going after what they want because they are not just logical, but more comfortable with their instincts. You need a little bit of irrationality in order to make a big move… not a lot, just a little! Click here, to learn more about Myant and the exciting work they are doing. Debbie Wu of Myant, speaking during the IWD2019 Women’s Leadership Symposium at Humber College, Toronto. 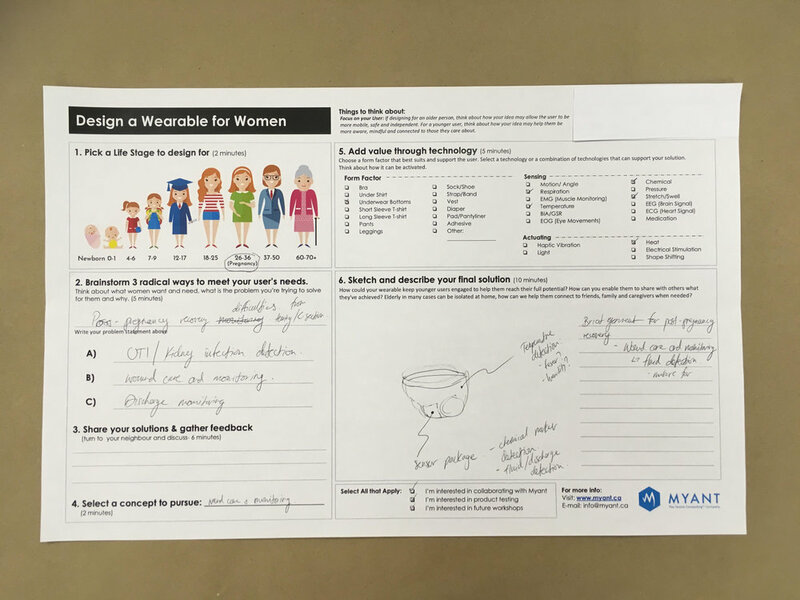 Myant asked delegates to design a wearable for women at a specific life stage. Delegates brainstorming a wearable for women based on their needs and the value that technology can provide.